The Library of Congress Classification (LCC) is a system of library classification developed by the Library of Congress. It is used by most research and academic libraries in the U.S. and several other countries. 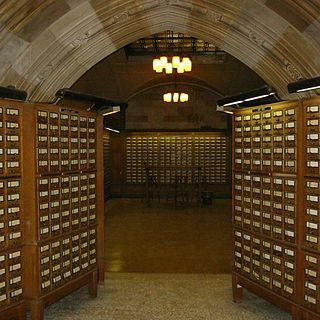 A library catalog or library catalogue is a register of all bibliographic items found in a library or group of libraries, such as a network of libraries at several locations. A bibliographic item can be any information entity that is considered library material, or a group of library materials, or linked from the catalog as far as it is relevant to the catalog and to the users (patrons) of the library. A librarian is a person who works professionally in a library, providing access to information and sometimes social or technical programming to users. In addition, librarians provide instruction on information literacy. An identifier is a name that identifies either a unique object or a unique class of objects, where the "object" or class may be an idea, physical [countable] object, or physical [noncountable] substance. The abbreviation ID often refers to identity, identification, or an identifier. An identifier may be a word, number, letter, symbol, or any combination of those. A check digit is a form of redundancy check used for error detection on identification numbers, such as bank account numbers, which are used in an application where they will at least sometimes be input manually. It is analogous to a binary parity bit used to check for errors in computer-generated data. It consists of one or more digits computed by an algorithm from the other digits in the sequence input. The hyphen (‐) is a punctuation mark used to join words and to separate syllables of a single word. The use of hyphens is called hyphenation. Non-hyphenated is an example of a hyphenated word. The hyphen should not be confused with dashes, which are longer and have different uses, or with the minus sign (−), which is also longer in some contexts. 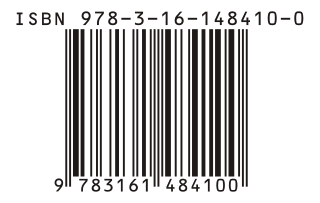 An International Standard Serial Number (ISSN) is an eight-digit serial number used to uniquely identify a serial publication, such as a magazine. The ISSN is especially helpful in distinguishing between serials with the same title. ISSN are used in ordering, cataloging, interlibrary loans, and other practices in connection with serial literature. A social insurance number (SIN) is a number issued in Canada to administer various government programs. The SIN was created in 1964 to serve as a client account number in the administration of the Canada Pension Plan and Canada's varied employment insurance programs. In 1967, Revenue Canada started using the SIN for tax reporting purposes. SINs are issued by Employment and Social Development Canada. MARCstandards are a set of digital formats for the description of items catalogued by libraries, such as books. Working with the Library of Congress, American computer scientist Henriette Avram developed MARC in the 1960s to create records that could be read by computers and shared among libraries. By 1971, MARC formats had become the US national standard for dissemination of bibliographic data. Two years later, they became the international standard. There are several versions of MARC in use around the world, the most predominant being MARC 21, created in 1999 as a result of the harmonization of U.S. and Canadian MARC formats, and UNIMARC, widely used in Europe. The MARC 21 family of standards now includes formats for authority records, holdings records, classification schedules, and community information, in addition to the format for bibliographic records. In library science, authority control is a process that organizes bibliographic information, for example in library catalogs by using a single, distinct spelling of a name (heading) or a numeric identifier for each topic. The word authority in authority control derives from the idea that the names of people, places, things, and concepts are authorized, i.e., they are established in one particular form. These one-of-a-kind headings or identifiers are applied consistently throughout catalogs which make use of the respective authority file, and are applied for other methods of organizing data such as linkages and cross references. Each controlled entry is described in an authority record in terms of its scope and usage, and this organization helps the library staff maintain the catalog and make it user-friendly for researchers. A national identification number, national identity number, or national insurance number is used by the governments of many countries as a means of tracking their citizens, permanent residents, and temporary residents for the purposes of work, taxation, government benefits, health care, and other governmentally-related functions. The number appears on identity documents issued by several countries. An index card consists of card stock cut to a standard size, used for recording and storing small amounts of discrete data. A collection of such cards either serves as, or aids the creation of, an index for expedited lookup of information. This system was invented by Carl Linnaeus, around 1760. The Malaysian identity card, is the compulsory identity card for Malaysian citizens aged 12 and above. The current identity card, known as MyKad, was introduced by the National Registration Department of Malaysia on 5 September 2001 as one of four MSC Malaysia flagship applications and a replacement for the High Quality Identity Card, Malaysia became the first country in the world to use an identification card that incorporates both photo identification and fingerprint biometric data on an in-built computer chip embedded in a piece of plastic. In libraries, art galleries, museums and archives, an accession number is a unique identifier assigned to, and achieving initial control of, each acquisition. Assignment of accession numbers typically occurs at the point of accessioning or cataloging. The term is something of a misnomer, because the form accession numbers take is often alpha-numeric. The personal identity number is the Swedish national identification number. It is a ten or twelve digit number that is widely used in Sweden to identify individuals. The Singerman list is a numeric cataloging system for antisemitica items, as defined by the 1982 bibliographic listing, Antisemitic Propaganda: an annotated bibliography and research guide by Robert Singerman. The list consists of a chronological listing, by year at least, of books, pamphlets, and other sorts of texts, with full bibliographic information. In addition each item is assigned a unique 4-digit number with a short, paragraph-length, annotation. For example, "Singerman 0121" identifies uniquely a particular imprint of The Jewish Bolshevism. Heinrich Biltz was a German chemist and professor. In the United States, a Social Security number (SSN) is a nine-digit number issued to U.S. citizens, permanent residents, and temporary (working) residents under section 205(c)(2) of the Social Security Act, codified as 42 U.S.C. § 405(c)(2). The number is issued to an individual by the Social Security Administration, an independent agency of the United States government. Although its primary purpose is to track individuals for Social Security purposes, the Social Security number has become a de facto national identification number for taxation and other purposes. The Computerized National Identity Card (CNIC) is an identity card issued by Pakistan's National Database and Registration Authority (NADRA). The card is issued first at the age of 18. There are two types of Identity card in Pakistan CNIC and SNIC. CNIC is Urdu version computerized card and SNIC is Pakistan's first national electronic identity card. Algerian registration plates are manufactured according to the same standards as their French counterparts, using the same font and dimensions – although there has been a recent tendency to apply custom typefaces. ↑ "Library of Congress Update for 2008 ALA Annual Conference: January-May, 2008". Archived from the original on 2017-08-28. ↑ "Structure of the LC Control Number".